Integrate Real World Content Into Your Courses! Integrate Real World content into your curriculum with ease! Integration is especially important in today’s’ cyber connected world. Use surveys and personal observation to choose age-appropriate, culturally popular text with your students. Respect their Real World choice whether sports cards, comic books, rap, or videogames. Check out the text yourself and add this as, or substitute it for, an option on your course of study. If you have never attempted to integrate Real World content into any teaching unit or if you have done little, a simple start with Real World text is manageable and fun to explore with your class. If you have done much integrated unit teaching, you have likely learned how to encourage students to lead the way to subject accommodations of Real World content and built several media text sets (print and non-print). * Real World knowledge of baseball; for example, can be relied upon to predict meaning in reading baseball sports cards. * Math knowledge; for example, expands understanding of RBI and Batting Averages on baseball cards. * Different print forms may offer similar information; for example, player information on sports cards, in souvenir programs, and on team websites. * Differences between print forms are used to find information; for example, player information from a program but seat information from a ticket. * Peer reading experiences and interpretations differ. Discussing reading with others, such as background of comic strip or movie characters is enjoyable and informative. * Discussion provides insight into other interpretations and points of view. * Exploring Real World content can motivate skill set acquisition and practice in classroom settings. 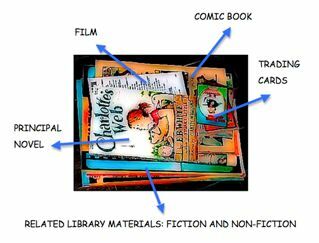 * A reader responds in different ways to reading; for example, collecting, taping, charting, drawing, researching, building, etc. And that is even before you add subject specific goals! Here is a range of starter ideas for you. Layer in complexity and/or subject specifics. Weave Real World content into your studies and help students find and establish connections between subject literacies. Return from Integrate Real World Content hub page to Real World Content Advantage home page.